Mon., Jan. 22, 2018, 10:26 p.m.
Kalia Charles scored a career-high 32 points, Eleanna Christinaki added 26 with six 3-pointers and No. 14 Maryland cruised past 12th-ranked Ohio State 99-69 Monday night in College Park, Maryland, in a duel for first place in the Big Ten. The Terrapins (17-3, 6-1) let a 19-point lead dwindle to 10 before limiting the Buckeyes to one field goal in a 16-6 run that made it 66-46 late in the third quarter. Christinaki, a transfer from Florida playing in her eighth game at Maryland, scored 21 points in the first half and Charles tallied 22 after halftime. 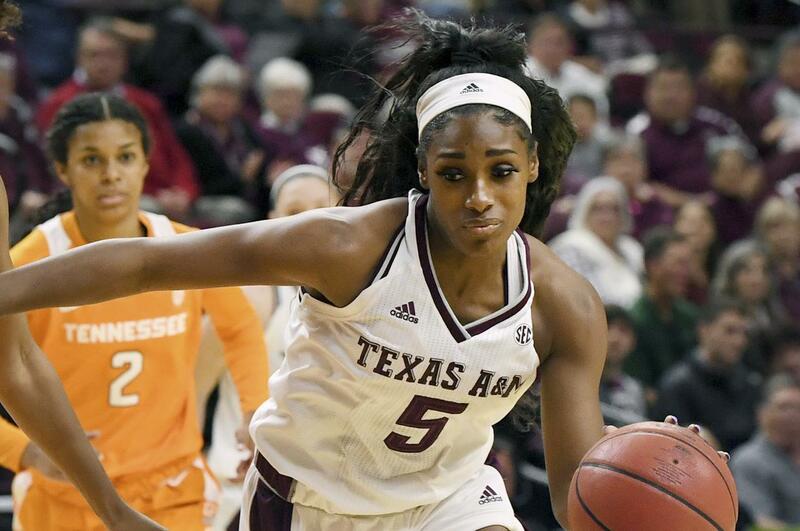 (15) Texas A&M 69, LSU 59: Anriel Howard had 21 points and 14 rebounds and the Aggies (16-5, 5-2 Southeastern Conference) overcame a three-point halftime deficit to beat the Tigers (12-6, 4-3) in College Station, Texas. Khaalia Hillsman added 14 points and Jasmine Lumpkin had 10 points, eight rebounds and eight assists for the Aggies. Chennedy Carter had 10 points to avoid the first single-digit scoring output of her freshman season. She was just 2 of 13 from the field and 6 of 8 from the foul line. Texas A&M trailed 26-23 at halftime and took control with a 15-4 run to lead 46-38 late in the third period. Carter’s first field goal of the game capped a 6-0 run to extend the lead to 10 early in the fourth and a Kayla Wells 3-point play with five minutes left gave Texas A&M its largest lead at 61-50. Raigyne Louis had 18 points, Chloe Jackson added 14 and Ayana Mitchell 13 for the Tigers. Published: Jan. 22, 2018, 10:26 p.m.